Melt butter with chocolate in heavy small saucepan over low heat. Finely grind cookies in processor. Add warm chocolate mixture; blend just until crumbs are moistened. Reserve 1 cup crumb mixture in small bowl. Press remaining crumb mixture onto sides, then bottom of 9-inch-diameter springform pan with 2 3/4-inch-high sides. Freeze. Bring cream and corn syrup to boil in heavy large saucepan. Remove from heat. Add chocolate; whisk until melted and smooth. Let stand until cool but still pourable, about 1 hour. Working quickly, mix ice cream, 1 1/4 cups crushed candies, and extract in large bowl just until blended. Spoon half of ice cream into crust; spread evenly (place remaining ice cream mixture in bowl in freezer). Sprinkle reserved 1 cup cookie crumbs over ice cream in pan; press gently. Pour 1 cup chocolate glaze over ice cream in pan. Freeze 1 hour. Top with remaining ice cream; spread evenly. Freeze until firm, about 4 hours. Stir remaining glaze over low heat just until pourable but not warm. Pour glaze over ice cream; spread evenly. Freeze overnight. Run sharp knife between crust and pan sides to loosen cake. Release pan sides. Transfer cake to platter. 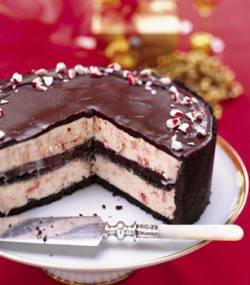 Garnish cake with peppermint candies and serve.